Mead fermented with heather, the mead of the Picts and Celts, was actually made throughout Britain, and in Scandinavia as well. Often associated with the legendary “Mead of Inspiration“, wherever it has been made it was believed to have extraordinary effects. Wild-harvested, unwashed heather blossoms are frequently infected with a kind of mildew, locally called “fogg,” that is related to ergot. Heather tips must be thoroughly washed to rid them of the fogg before they are sold or used in brewing. Unfortunately, this process removes as well a natural yeast that was used in olden times to ferment meads and ales made with heather. Nonetheless, heather blossoms themselves produce a mild narcotic and sedative effect, and appear as a traditional ingredient in herbal medicine. So it is possible to ferment a heather mead that is somewhat psychotropic, and delicious as well–a taste of ancient Pictish culture. While the heather blossom’s contribution to the mead is unmistakable, the real key to its authenticity is heather honey. This honey is truly remarkable. In addition to its unique, distinct taste, heather honey is profoundly aromatic. A drained glass that has held heather mead will perfume an entire room for hours afterward, spreading an aroma like fresh beeswax mixed with flower blossoms. It’s likely that some of the fogg mentioned earlier finds its way into the heather honey too. Heather honey also has a property, shared with only two other types of honey, known as thixotropy. When it has been stored undisturbed it will become thick and gelatinous. When it is stirred it will liquefy like ordinary honey, until after a few days it returns to its jelly-like state. This is because heather honey contains a large amount of protein, as much as 2 percent in some varieties, and this property makes it very difficult to extract from the comb. Heather covers hundreds of square miles of land throughout Great Britain and Northern Europe, and when the plants are in bloom beekeepers undertake a major effort to collect their nectar, moving hives from all across the country. Still, heather honey is a relative rarity, and damned expensive. The heather mead I made cost about forty dollars a gallon for the honey alone. Still, I think it was worth it. Started on the summer solstice, 2011, the mead combines Scottish heather honey from Perthshire with organic Scottish heather blossoms and spring water from the Alberta foothills. The water was heated to pasteurization temperature and the blossoms were added and steeped overnight. This tea was boiled and removed from heat to stir in the honey and yeast nutrient. Cooled to room temperature the must was inoculated with White Labs WLP720 mead yeast. Starting gravity was 20 Brix. I added additional heather flowers after five days of fermenting by steeping 30 grams for 15 minutes in a liter of mead drawn from the fermenter and heated to 158F. After three weeks the mead was racked into jugs and bulk-aged for 18 months. Solstice Heather Mead fermented out to a semi-dry finish, with a flavor reminiscent of sherry. I saved some of the honey for back-sweetening, and will try different amounts to experiment with residual sugar. The mead is a pale gold in color, with a huge honey/floral perfume. 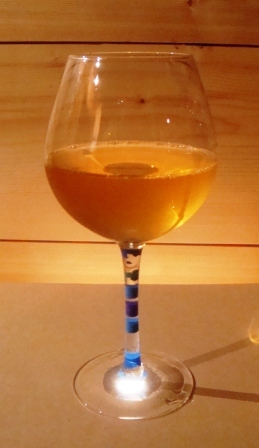 While the first impression is of a dry wine, that changes to a more complex flavor as the mead is warmed in the glass. While it is as potent in alcohol as a white wine, there is definitely something else going on there, something that Nechtan Son of Erip would certainly recognize. This entry was posted in Uncategorized and tagged fermentation, heather, heather mead recipe, homebrewing, mead, umami. very cool! thanks for sharing your heather mead techniques… I’ll be experimenting with heather in a smoked sour wheat beer soon, and thought it would be worth a try on a gallon of short mead I recently made, so since I didn’t boil, ferment, or “dry heather” it, I’m going to make a little tea on the side and blend it in at bottling like your last step. guess I’ll use a bit more than 30g, but that should be a good starting point. After reading this, I’m looking forward to making a full Heather Mead in the future, so Thanks Again! Heather mead is incredibly intense in flavor. Also, the honey is hugely expensive by the 12 ounce jar! I actually made an “accidental” sour heather ale by grinding my grain in the brew room. Oops. The dust settled out for days. I saw a pellicle form and got bummed out, but since I’m cheap, I didn’t throw it away. In the two intervening years, sour beers became a big deal so I tested it on one of my friends who pronounced it delicious. The key is to let them age for quite a while. Cheers! I have been doing some research on heather honey making. But it seems finding the right supplier is the hardest part of the research. I would like to get the best quality product for the mead. Is there any bee keepers that you would recommend? I bought the honey for this mead from Heather Hills Farm in Perthshire, Scotland. It’s expensive, but they will sell you a case. I used 12 jars to make the mead. I still have a few bottles left and they are magnificent.